Why do we like fairy tales? Do we like them because they always end in “happily ever after”? Do we like them because they are so far removed from our harsh realities? Do we like them because they take us back to an age (you know, like never for me) where the words “harsh realities” were unknown to us? 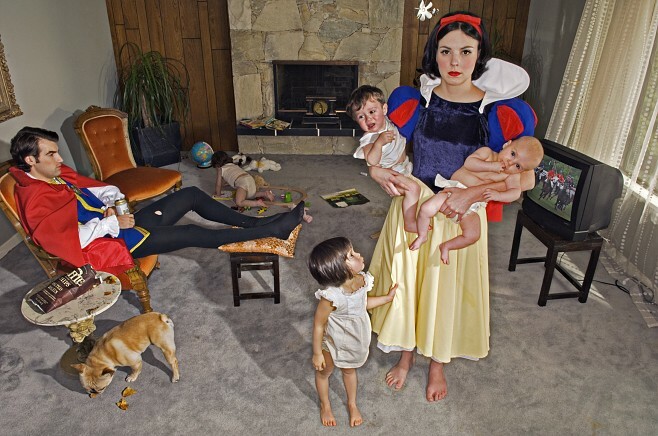 But who says we want our fairy tales to give us a dose of reality? Don’t we want them to take us away from it all? Well, perhaps times have changed. Take note that, more often than not, new fairy tales (like “Enchanted” for instance) take a feminist turn that has the princess saving the prince, not the other way around. I thought the one featuring Jasmine was just disgusting. Musimah Media Watch has a good post on why. Rapunzel was really chilling. And I didn't care for Jasmine, it seemed awfully negatively stereotypical to me, but then, so was Snow White. Perhaps just not in quite the same culturally offensive way? Myself, I kind of feel like it is good to have that dose of a sweeter reality sometimes – I love films like Enchanted, where they are updating those themes so that women can save themselves, but we STILL get the singing animals and happy ending. Maybe I am the first to catch it, but all the princesses are Americanized, except for Jasmine. Snow White and Little Red are Germans and Cinderella is French. Why not Americanize Jasmine instead of make her some Arabic commando (not likely in many nations there anyway).